My love affair with a Ryobi Tile Saw, don’t worry my husband loves it too. Starting out in the DIY world, one may not have all the tools they need to do the job they want to do, and so rely on generous friends to let you borrow theirs. A few years ago when we took on the peel and stick tile project for our kitchen, we ran into this issue ourselves. We really didn’t think we would need a tile saw of our own and instead borrowed one. 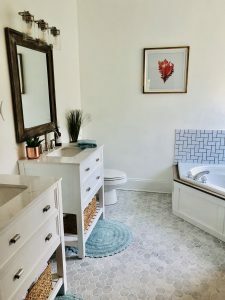 While we were very thankful, we knew when we were given the opportunity to be a part of the Jeffrey Court One Room Challenge and the 220 sq ft of tile that came with it, we needed something of our own. It’s done and I could not be happier with how it turned out! Taking the shower insert out allowed us to expand the shower out and the tile to the ceiling. When we received the Ryobi Tile Saw and stand, we were pleasantly surprised at very little that needed to be assembled. We have a large line of Ryobi products from the One Plus+ system, so this was our first corded product from them. Not that the cord was ever an issue. It was also very light, yet very sturdy. 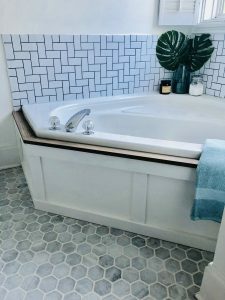 Needless to say, we definitely put it to the test with this project, because 220 sq ft of tile is no joke. 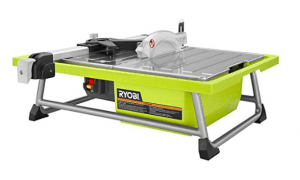 The Ryobi Tile Saw is lightweight, quiet and has minimal to no water spray. 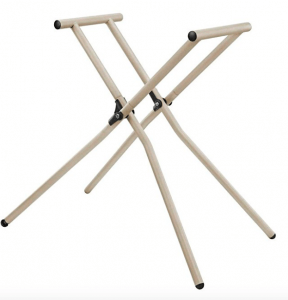 It can either be placed on a table top or you can purchase a separate stand. You know what surprised me the most? Even though it was a tile saw and we set it up in our garage, it was surprisingly quiet AND there was little to no water spray. (Unless you prematurely lifted the guard, but that was user error and not the tool. Yes, that was me and yes I did get wet.) Other tile saws that we used had us looking like we had gone for a swim while using them. Having the Ryobi Tile Saw close to whisper quiet was a huge relief considering there were A LOT of late nights and the garage where we were cutting the tile, is right under our girls bedroom. Not only is the Ryobi Tile Saw quiet when compared to other saws, there was minimal to no water spray. 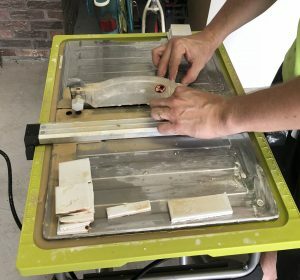 This tile saw has the ability to do mitered cuts, which we didn’t need on this project, but appreciate for any future projects. 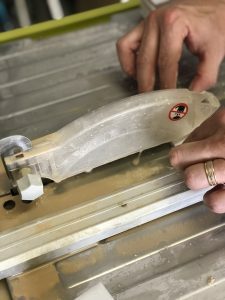 The tile saw comes with a 7 inch diamond cutting wheel, which we were able to make pretty small cuts with ease and with very minimal to rare chipping. Each cut we did make was super smooth from the first to the last. So smooth in fact, that it was often difficult to tell which side was the cut side. 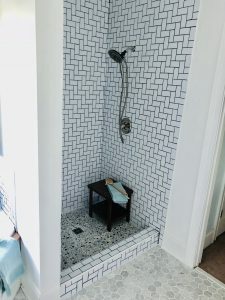 Our project only required smaller tile and not larger tile, so I cannot comment on how it would handle the larger tile pieces. According to my research, you can rip cut 20 inch tile and diagonal cut 13 inch tile. I only have one knock on this product and really it’s a minor one. 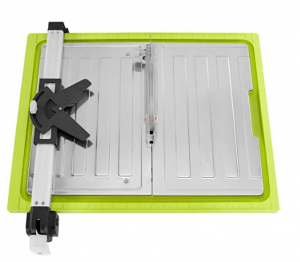 There is a way to line up your cuts on the tile saw with the locking rip guide, but it’s kind of difficult to see because it’s the same color as the body of the saw. I think if they just added color to the numbers and dashes, it would be extremely helpful. Nothing major, but those late nights and tired eyes need all the help they can get. Top View of the Ryobi Tile Saw with rip cut guide. My only suggestion would be to darken the numbers and dashes to make it easier to see. Here you can see the measurement markers for the rip arm and how they blend in with the top of the Ryobi Tile Saw. Overall I was very impressed with how easy it was to use the Ryobi Tile Saw and stand. The minor assembly, lightweight, darn near whisper quiet, and no water spray were a huge thumbs up in my book. (Oh and because it was so easy to use, we still have all of our thumbs and fingers for that matter.) I would definitely recommend purchasing this Ryobi Tile Saw if you are in the market to buy one. 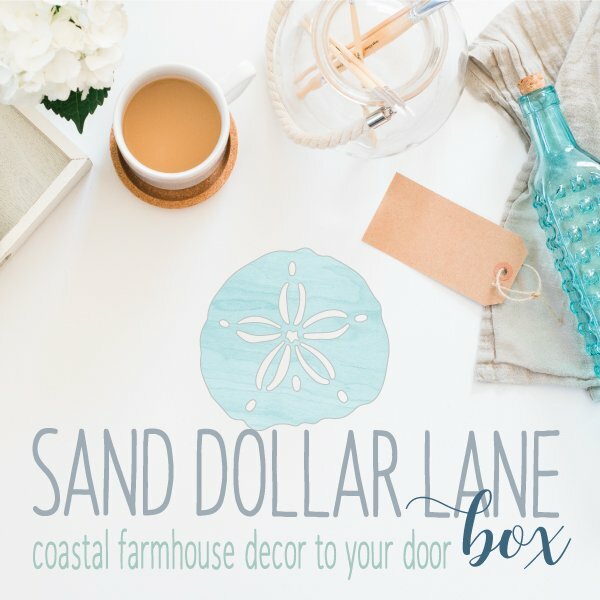 Stay connected for all your DIY and organizing needs!